I just got back last weekend from an epic 2 week road trip across the US with my fantastic copilot boyfriend. Our main goal was to return to Utah for a friends wedding, but of course we had to make some fun stops along the way. We went South before heading North, and then back East: Virgina, Tennessee, Oklahoma, Arizona, Nevada, UTAH, Colorado, Iowa, Illinois & Pennsylvania (home). It was so fun, but man did I miss cooking. There are only so many gas station sandwiches you can eat before you begin to loose your mind. Road food is fun for a day & then it’s just downright bad. So needless to say, once I was unpacked, laundry was washed & I was starting to get back to my routine, I started scouting out some tasty recipes to try out. I had around 4,000 frequent flyer miles, sounds like a lot, but of course not nearly enough for a free flight. So what does the airline do with those miles you ask? They offer magazine subscriptions at no cost, simply use my miles for the ones I want. Cool right? Not really, but hey, it’s better than nothing right?! One of the magazines I subscribed to was Everyday with Rachel Ray. There are a lot of delicious sounding recipes in the magazine, so I’ll take it as a win in the selection book. I have cooked 2 of the recipes in the magazine, adding my little spin on them, of course. That’s where all the fun is, and eating all the food, but that’s a given. In the magazine the recipe is called Cauliflower & Caper Pasta. It’s a really delicious dish. I have been wanting to cook something with capers for a while now. I always loved anything with capers & lemon. The tartness of both just goes so well together with chicken, pasta a lot of things really. So once I saw “caper” in the title, I knew I was going to try it out. The hardest thing about this recipe is crisping the capers. Now I have never fried anything a day in my life. I’m scared of hot oil, just like I’m scared of the broiler. Dummy me did not have a cover for the frying pan to prevent the oil from going EVERYWHERE once I added the capers to the pan. Learning curve. Needless to say I walked away with only minor oil burns & by minor I mean, just redness for a day and an initial sting. They always say you learn from your mistakes, & yes, yes I did learn from my mistake. So please, if you’re going to make this dish, be EXTRA careful when crisping the capers & the cauliflower. I don’t want anyone else burning their precious hands. Serves: 5 Total Time: 45 Min. 1 Box of Spaghetti, I use Barilla Protein Plus, but any Spaghetti will work just fine! 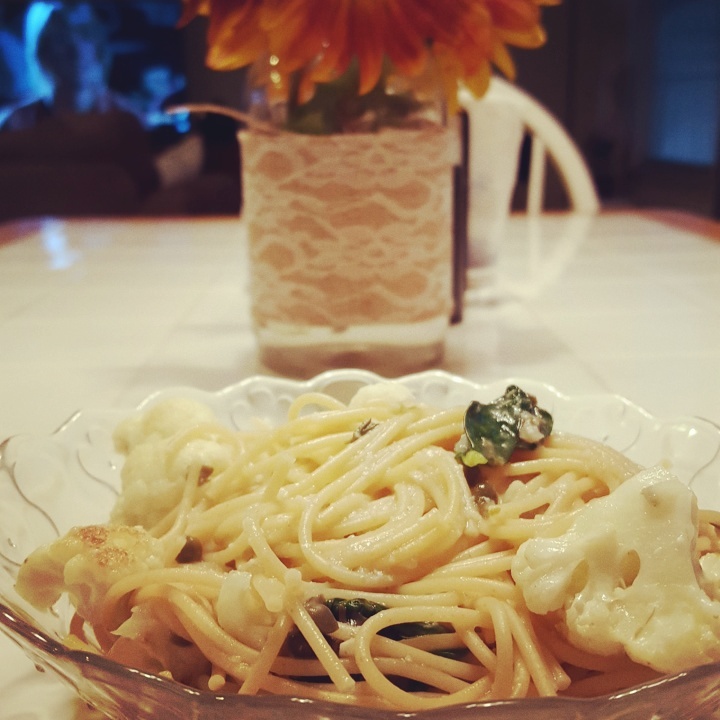 While pasta is cooking, cut cauliflower into bite size pieces, wash & pat dry. Drain capers & pat dry. Begin heating up a medium-large frying pan with olive oil on medium heat. Add capers to hot frying pan, BE CAREFUL. If you have a frying pan screen now is the time to use it! Work capers around in pan until crispy, approximately 8 minutes. Scoop out with a slotted spoon & place into a bowl on the side. Begin adding cauliflower florets to frying pan. Work around pan until browned, approximately 8-10 minutes. Add garlic, water, white cooking wine w/ lemon flavoring & fresh time. Combine together & add capers & spinach. Once heated through & pasta is cooked & drained, add to large bowl with pasta being sure to cover all of the noodles. Top with parmesan cheese mixing well. Serve immediately & ENJOY! Gah that looks incredible! Love what I’ve seen of your blog, looking forward to following.